Adolph Gottlieb, The Sorceress, 1947, oil on canvas, 48 1/16 x 36 in. (122.1 x 91.2 cm), Art Properties, Avery Architectural & Fine Arts Library, Columbia University, Gift of Mr. and Mrs. Samuel M. Kootz (C00.406). Art Properties has loaned a painting to the exhibition Dealer’s Choice: The Samuel Kootz Gallery 1945-1966, now open at the Fralin Museum of Art, University of Virginia in Charlottesville. This exhibition focuses on gallery owner Samuel Kootz (1898-1982), who was instrumental in showcasing some of the biggest names in mid-century European and American modernism, including the Abstract Expressionists. He had galleries on East 57th St. and Madison Ave. for more than twenty years, and he authored two books on modern American art: Modern American Painters and New Frontiers in American Painting. 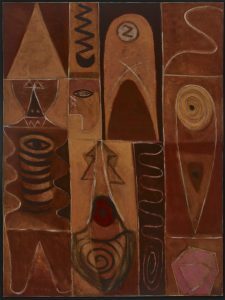 The painting on loan from the Columbia University art collection is The Sorceress by Adolph Gottlieb, painted in 1947 and exhibited that same year in Kootz’s landmark exhibition Women, which also included work by William Baziotes, Robert Motherwell, Pablo Picasso, and others. Gottlieb’s painting was donated to Columbia by Kootz and his wife in 1960. The exhibition at the Fralin runs from August 25-December 17, 2017, and then travels to the Neuberger Museum of Art, Purchase College, State University of New York from January 21-May 20, 2018. This entry was posted in Art Properties, Exhibitions on August 28, 2017 by Ted.